I retired from being a studio potter in 2014. For 35 years I have made functional, wheel thrown pottery. The porcelain pieces were all hand painted with my own designs. 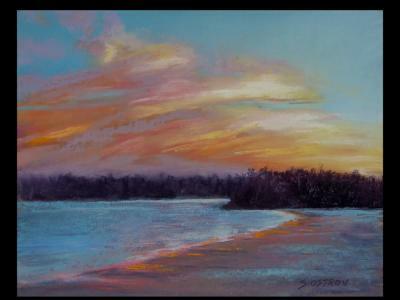 I became interested in working with the pastel medium a few years ago and it has fully engaged my interest and passion. I have always been an outdoors person. I love hiking and exploring beautiful natural areas. Painting landscapes have naturally evolved from that interest. The pastel medium is very direct and immediate. That too is a natural outcome of working with clay for so many years. I love painting water and skies with particular emphasis on light and it's impact on the landscape environment. 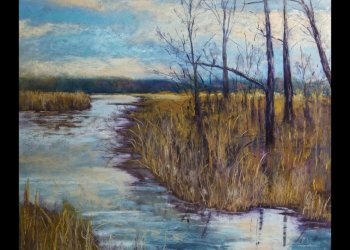 All paintings are pastel on museum grade paper, mounted on archival foam core and framed. There are misconceptions regarding pastel. Pastels are an art medium in the form of a stick. They are made with pure pigment and a binding material. The same pigments are used to make oil paint and other colored art media. Pastels have been in use by artists since the Renaissance. They were popular in the 19th century and used by artists such as Degas. Pastel is not "chalk".